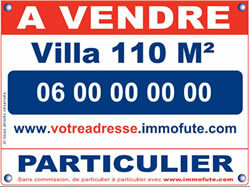 To sell, rent, or buy a real estate, immofuté.com is your solution ! Something is missing on your website ? Your personal website is not visible enough ? You meet with difficulties, you don't have the time to create your website ? In every situation, we have the best solution : discover our options. In addition of the creation of your personal website, immofute propose numerous options. These options will allow you to improve the attractiveness of your personal website (pictures, video), to make it more visible on internet (multi-diffusion, Google Adwords), or to be assisted during the creation and the management of you website. Situated in a very visible box, a large photo will showcase your property and will get you noticed. This picture is stressed by a title (type of property + city + price) of the property and a direct link to your personal website. Do not wait any longer be on the spotlights ! Votre site perso (page infos express + galerie photos). This video represents a real value-added to your personal website. Don't forget that the broadcasting of you video highly improve your referencement by the search engines. See an example here. One of the best advantages of you personal website is that it can be spread everywhere thanks to a link. But advertise on ads website, write posts on forums in order to diffuse the link to our website can be long and tedious. That's why we propose the multi-diffusion option which consists in spreading your website for you. We also have our little tips! You look for buyers on internet, it's very good, but potential buyers could simply go past your house... So not to miss them choose the local visibility option. We build a quality billboard showing your contact details, and you personal website address. You don't have internet at home, you don't have the time, you are not familiar with internet, we guide you step by step. Benefit of the assistance option and we create your personal website on the phone or by mail and you only have to spread it.